So, back in 2012 (?! ), Basil once told Kevin that he really needed to go to an interview with Richard Epcar. And Kevin did, and a wonderful time was had. Well, John was also there in 2012. And since he had the chance to interview Richard Epcar again, John leapt at the chance. 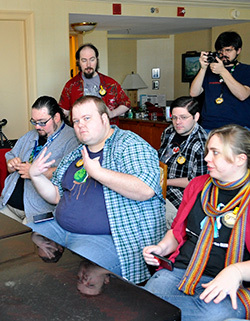 That was at Momocon 2018, and this is that podcast. Also in case you were wondering whom Richard Epcar is, he’s a lot. Of voices, I mean. He has done a bunch of them! Lately you’d recognize his vocal talents bringing to life Ansem, from the Kingdom Hearts series. There was like, three of those game? So anyway, he has also voiced Raiden from the latest Mortal Kombat series of games, Joseph Joestar from the Jojo’s that everyone (rightly) loves, Batou in all the Ghosts in the Shells that matter, and just whole lot of things. There is a very high chance that he done something you love, and he may just be the reason why! This time, our interview is uh… intergalactic! And uh, spectacular! Legendary? Is that a thing? Well, the thing is that this is an interview with Josh Keaton! He has done a bunch of cool voice-over roles like Shiro in Voltron: Legendary Defender. Or Spider-Man in The Spectacular Spider-Man, or if you would rather someone more potentially villainous, Norman Osborn in Marvel’s Spider-Man! And if you really wished he voiced a guy named Jack, oh hey! He was Jack Darby in Transformers: Prime. When we last checked into the Momocon Indie Games area when they started in 2015, we covered 18 games. Well, now it’s 2018! 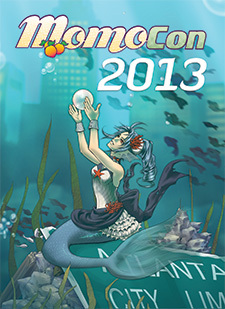 So how many games did we check out in this year’s Momocon? *counts* 23? GOOD LORD. Here’s our takes on said 23 games, live from the archives during Momocon 2018. Oh hi! The OSMcast (and friends!) went to the latest Final Fanatsy XIV Fan Festival in Las Vegas, to check out all the sweet surprises they had in store! And boy did they! A new expansion, and lots of teases as to what’s coming up next. But we did as much of the Festival as we could, so we could bring it all back to you here. In audio form, no less! But we also have BONUS PICTURES for you as well! So speaking of Momocon, this was the first year where they really blew up their video gaming to something truly huge. Something special. they called it the MGX, or Momocon Gaming Experience. Not only was there tons of tabletop gaming to be had, or console gaming, or even an arcade, as they had all of these things. But what Momocon also had, was an indies space for video games. And along with our pals from Chainsaw Buffet, we played almost all of them. These are those stories. As recorded late at night during some night at Momocon. That… was a lot of links. Please, go click on them! Find something new to play! And bug the wonderful C63 folks to make that sweet sweet train game I know is secretly in their hearts. Next time, something fresh off the microphone! We are kicking a few ideas around. If you have any ideas of topics of things to cover, feel free to hit up Basil on Twitter. Or Kevin! Or hey, even the OSMcast account itself. We are not picky. Long time, no podcast? Well, let’s fix that! We’re going to start with an OSMinterview we did with Greg Weisman during this year’s Momocon along with the Chainsaw Buffet podcast. Greg Weisman was one of the co-creators of Disney animated series Gargoyles, and also worked on Young Justice, as well as Star Wars Rebels. We talk to him about all those things, but we also chatted about his books Rain of the Ghosts, as well as it’s sequel book Spirits of Ash and Foam. Firstly, big thanks to both Greg Weisman and Momocon for making the interview possible. You should all check out his books! Basil sure did, and will probably report back in on those soon enough. Secondly, hi we’re back! And we even have a second episode being prepped for next week! So that’s exciting. So with Hamacon’s Minicon going on this past Saturday (Which went very well thank you for asking! ), we did not have a chance to record an OSMcast proper. However, we didn’t want to leave you hanging and as it just so happens… Basil was on the latest episode of the Chainsaw Buffet talking about GMX, Tennessee’s Geek Media Expo. Listen in on talks of Peggle! Awesome shojo-esque Kickstarters! How Basil reads books! AND SO MUCH MORE! What the- A podcast posted by the OSMcast! about a con that is more recent than a year ago, perhaps even posted within the month it actually OCCURRED in?! Could… we be actually getting our act together!? Maybe! Although really it’s with the help of the wonderful, gallant, and lovely gents from the Chainsaw Buffet, our ever awesome OSM compadres from the land of the North (of Alabama, in Tennessee). Once more, we have teamed up our forces to bring you the tales of derring-do! This time, we have dared Momocon: Atlanta’s Anime, Animation, and Gaming Convention. And we have returned to audio spin those yarns! Even More Manga You Need to BUY RIGHT NOW (Friday 10 AM, Fan Panel 2) Manga, the world of Japanese comics. There used to be an absolute ton of these things on the market, but times are changing and not for the better. However, there are still a great many series and one shots that are being published today! And we are going to tell you all about them! Engrish Jamboree (Friday, 3PM, Panel 2) Rs may not be Ls but when you are speaking English in Japanese the lures go light out the window! The Engrish Jamboree is what happens when you take one language and churn it through another language with hilarious results. Anime and Live-Action clips, music videos, if people are fumbling through English, we got it. Getting Your Anime Groove Back (Saturday, 9PM, Panel 2) Anime burn out happens all the time. Sometimes life gets in the way and people lose interest in keeping up with the latest shows and news. This panel looks at a few shows that may rekindle that anime fan deep inside that just wants to be free again. Of course, times for these things can always change. We’ll see you… next week! Or perhaps… EVEN SOONER?! We have some smaller, more bite sized episodes we can upload. So you will be hearing more from us much sooner than one would normally think. It’s Catch Up Week* here at the OSMcast where we realize that the Chainsaw Buffet guys posted audio we were in and so we should PROBABLY post that up as well. So for today’s** Catch Up we have got for you the greatest GMX Vol. 4 topic-ed podcats a podcast could podcast about in a podcast. Basil and Kevin from the OSMcast throw down with John, Charlie, and Dylan-chan* from the Chainsaw Buffet to rap about all things GMX Volumed The Fourth. The guests, the events, the DENZELS, and all the rest, here on OSMbuffet Isle! **We posted both Catch Ups today. I thought we should point out that the Chainsaw guys are celebrating their FIFTH BIRTHDAY this year and and now that they enter their Fabulous Fives we hope that they continue on in epic fashion. While at GMX, they filmed several of us recording some of our most loved memories from their fives years of existence, in a documentary that is all 100 percent true and factual. It’s in three parts, and you can find all three here, here, and also here. Coincidentally. in March the OSMcast will ALSO turn 5! Also, as this is episode 93, next year (hopefully) we will be reaching OSMcast 100! 100 episodes! One hundred! So please let us know how you think we should celebrate this! Because we have no clue! 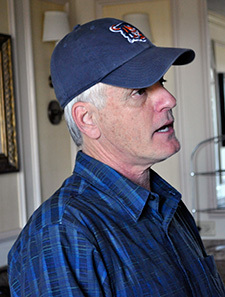 So for today’s** Catch Up we have got for you the audio from the press conference the wonderful people at GMX set up for Rob Paulsen. Chances are, Rob has voiced everyone from cartoons you cared out that wasn’t done by Steve Blum*** or John DiMaggio***. He’s the the voice behind Raphael from the 1987 cartoon of Teenage Mutant Ninja Turtles, Yakko Warner and Dr. Otto Scratchansniff from Animaniacs, Pinky from Pinky and the Brain and Animaniacs, and ALSO voice of Donatello from the NEW Ninja Turtles cartoon. And he’s also pretty amazing. But chances are you know that already****! ****You know that already because you already listened to this thanks to the Chainsaw Buffet podcast. Right? RIGHT? ?